Relish the memory. : A City and Herb so Fresh it’s MINT: Part 2. Back again with a few more Minty Melbourne Tales. Starting with a mint-laden meal shared with a few of my faves in the funky district of Fitzroy. 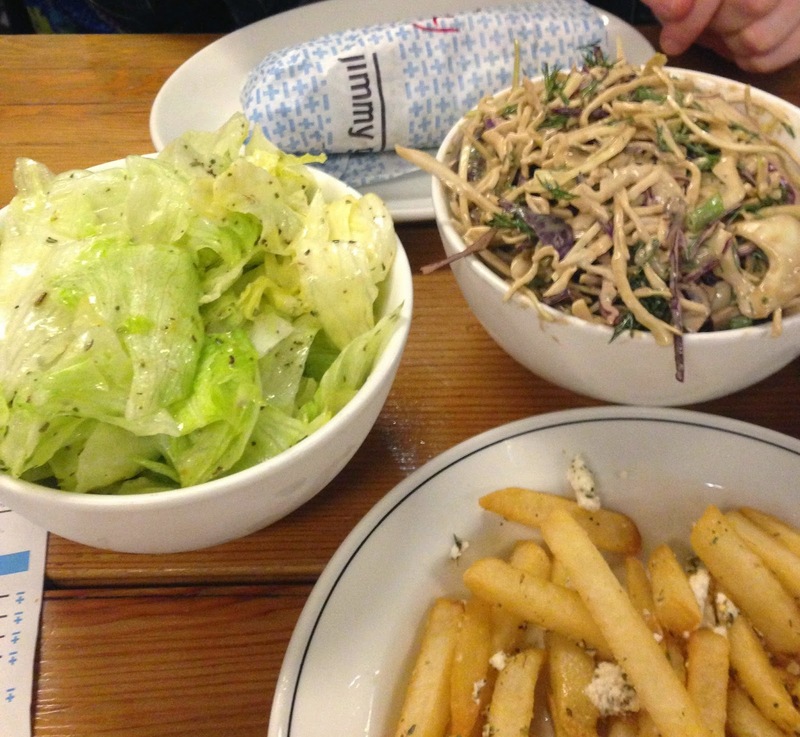 A casual Greek-inspired restaurant that goes by the name: Jimmy Grants. This was the perfect midweek munch, with a menu featuring souvas or souvlakis, crunchy flavoursome salads, spit-roasted meat, tasty sides and plenty of persuasive options to have you finishing up on sweet street. Jimmy G's Sweet Spread ft. Prawn Attiki & all that Fresh Mint! Chips & Dips. The Best kind. As expected we ordered a little bit of everything. From the ‘Bonegilla’ Souva filled with lamb + chicken + mustard aioli + chips + onion + parsley, to the ‘Homer’ stuffed with falafels + greek yoghurt + hellenic slaw through to the ‘Patris’ (my pick) packed with prawns + attiki honey + mayo + cucumber + coriander and that wee gem herself, mint. Each was a genuinely joyous combo wrapped in a soft, pillowy yet delightfully chewy pita bread. Simple and so god dam delicious. No fancy price tag here either, each souva costs less than $9 and all were devoured within minutes. Glory Bowls ft. Iceberg Salad & Hellenic Slaw. Our accompaniments went by the name of Hellenic slaw - shredded cabbage with honey & balsamic dressing, then came the classic Iceberg Salad - dressed with oregano, lemon and olive oil. Finally one (or was it two?) plates of chips, spiked with garlic oil, feta & oregano. Each dish had me licking the bowl for every last fleck of greek-greatness. Jimmy Grants was a definite highlight on the trip, so unpretentious, so affordable and so very quintessential Melbourne. A must-visit if you find yourself across the ditch. 'Jimmy's Wheel' took us to the end of Sweet Street with a Giant Peanut Butter & Raspberry Jam Mallow puff. 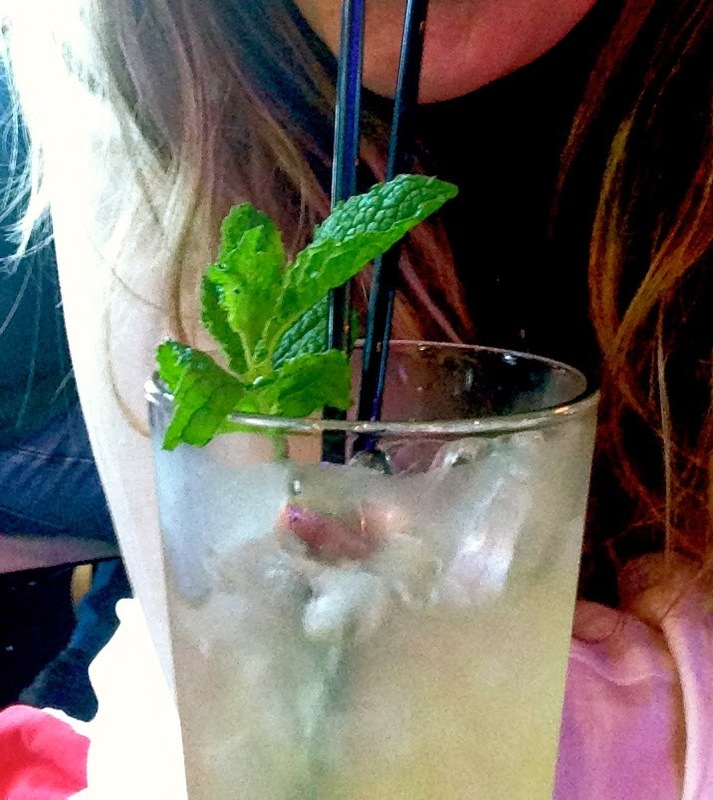 My final mint memoir was the last hurrah – in the form of a cocktail enjoyed with my mother at the Melbourne airport. Not one to normally hit the cocktails, the combination of Bacardi white rum, lime, sugar syrup, soda water and fresh mint seemed to twist my arm and this refreshing bevvy went down a treat. Since Melbourne, Mint has been incorporated into as many meals and dishes as possible, at any time of the day. From sweet minty morning omelettes, to flavouring salad bowls, whizzed into smoothies and freshening up my water bottle. I may or may not have gone mad about mint. Despite a lack in mint of the fresh kind, the next destination was a must-try and one I simply had to include. A place that truly did make my Melbourne trip MINT! 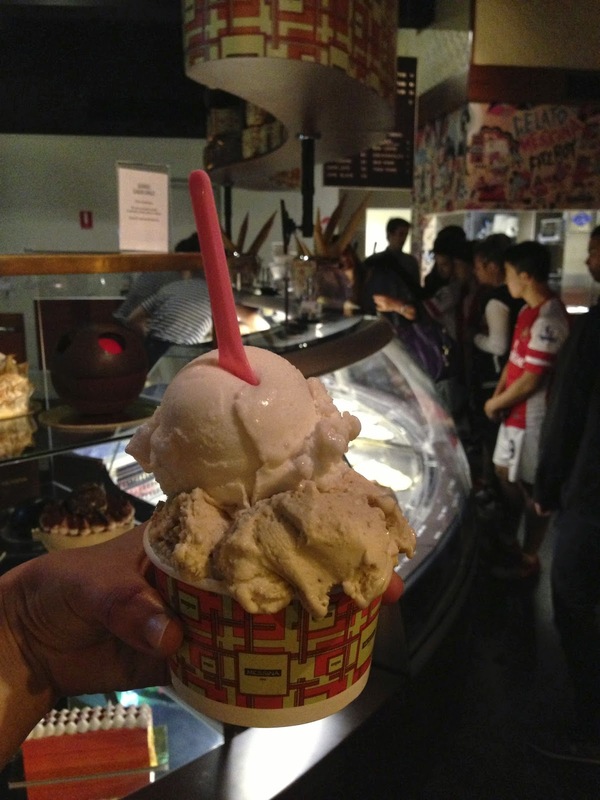 Gelato Messina is the godfather of all gelato. 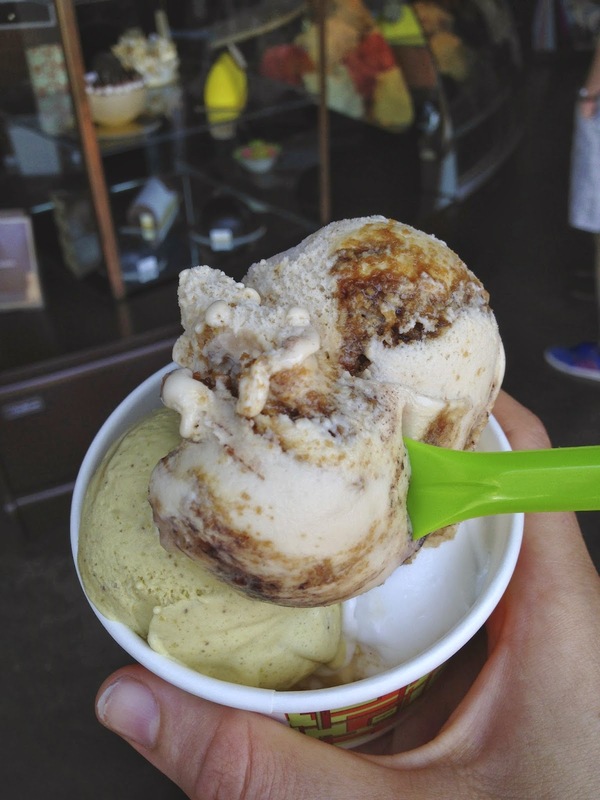 If you know your gelato – you’ll know Messina and if not, you probably should. With a few stores throughout Australia it has quickly become something of an institution and it's not hard to see why. One freezer of five. Mint (the Choc version) included! Classic flavours are made fresh daily, along with a handful of weekly specials the smooth spoonfuls of heaven were knocking on the door of my life highlights. You can only imagine my face when I saw the variety on offer. The phrase ‘I die!’ somehow felt like understatement. Decision made. One of the best of my life. With flavours including: The Mighty GM – Peanut Butter Gelato w/ Choco Crust, Chocolate Custard, Banana Jam & Peanut Cream, to Pretty Shady – Passionfruit Sorbet w/ Coconut Lychee & Black Sesame Praline, to Pannacotta with Fig Jam & Amaretti Biscuits. Dribbling yet? Then there’s their signature flavour range featuring: Salted Caramel & White Chocolate, Apple Pie, Chocolate Sorbet, Bounty and Baklava. We were served by a gorgeous foreign girl, who sensed our excitement and more than happily provided us with ‘testers’ of her top ten flavours. After more 'OMG YUM' moments than a girl could count , I was faced with decision time. Which flavour would make the cup? Take Two. Lunch is served ft. Tiramisu, Pistachio & Salted Coconut & Mango.